Hey! Who's up for a trip to Vegas? Me neither. The city didn't click for me in the whole two times I visited, for a number of reasons: gambling, while thrilling when you are winning, becomes a math-to-life equation as soon as I start losing. "Well, I lost at that hand of 21, so that's X amount of hours I'll have to work to make up for it..." Algebra comes in handy after all! And you try to get away from the gambling and look for a good beer on the strip, but no dice. Yeah, there's the place in the Monte Carlo with a ton of taps, but the best thing you're going to find is Union Jack or Sculpin that has been sitting in kegs forever. And pools are fun for awhile, but laying out at one all day? You ever see that video of the people at the resort at like 6 in the morning, waiting for the lounge chairs to be put out so they can stake their spot near the pool? It looks like the Cabbage Patch Doll rampages from the 80's. Just to lay by chlorinated water. There is, however, something rational-minded people like you will should find appealing if stuck in Vegas: CraftHaus, an up and coming brewery that you should visit instead of the "beer bars" with a chef's name attached. 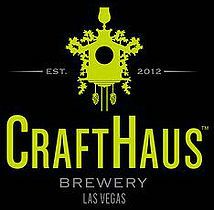 CraftHaus recently celebrated their 2nd anniversary, and with it came a 13% Triple IPA named Hop Bomb, a Mosaic heavy beer that somehow managed to feature the hops prominently without being overly sweet (hear that, Devil Dancer? What have the stores reduced the price on that one to, like $10 a four-pack now?). CraftHaus has a couple of canned offerings, with Resinate IPA and Evocation Saison available in stores around the city and state. Seek this brewery out instead of that four-foot tall bong of Jack and Coke!